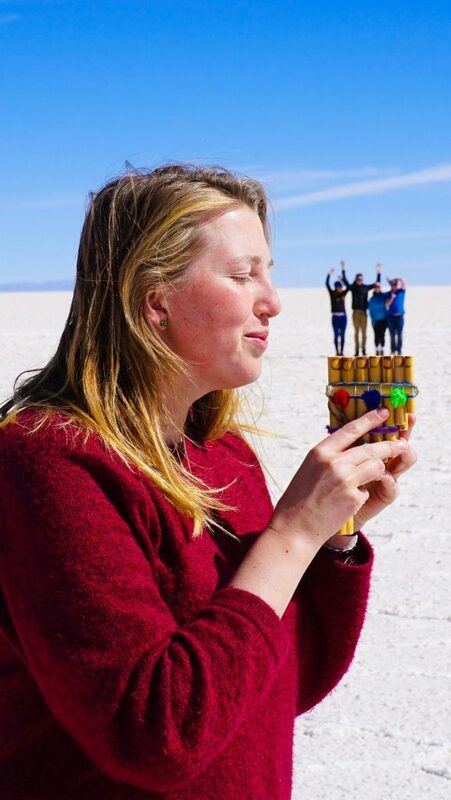 I’m sure you’ve all seen the iconic photos from a Bolivia Salt Flat Tour, you know the ones – people sitting in shoes, or sipping out of a giant wine glass – but do you even know where these great pictures of perspective can be done? Or about the other amazing highlights of the region? 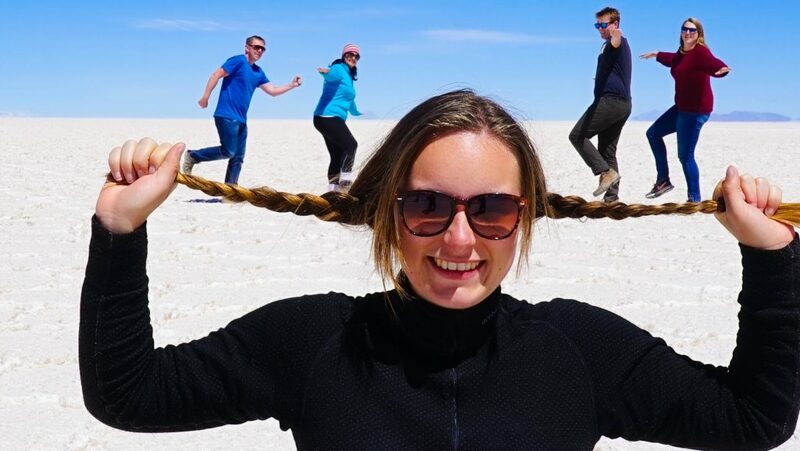 Well have no fear – I’m about to tell you about this and all the other great things you can do on a tour of the great Bolivian Salt Flats a.k.a Salar de Uyuni: the world’s largest salt flats! 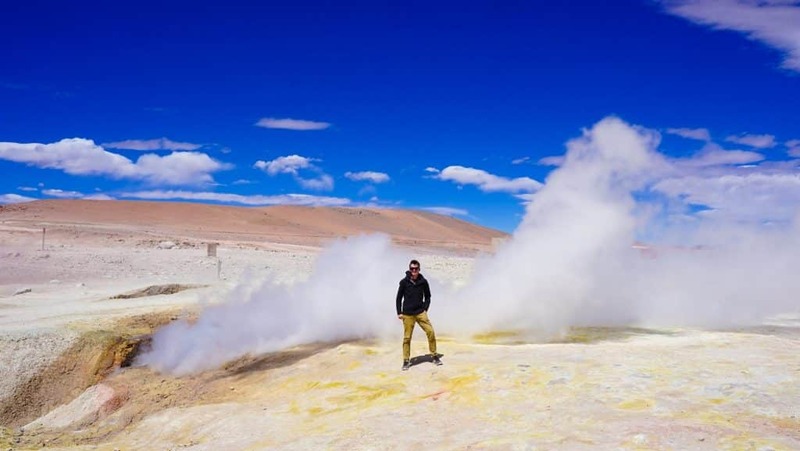 Surrounded by the Andean mountains on a high plateau or altiplano of amazing geology and bizarre scenery one of the best ways to experience Salar de Uyuni properly is on a 3 day Bolivia Salt Flat Tour jeep trip – and as we found, one of the best operators out there is Cruz Andina Traveller! 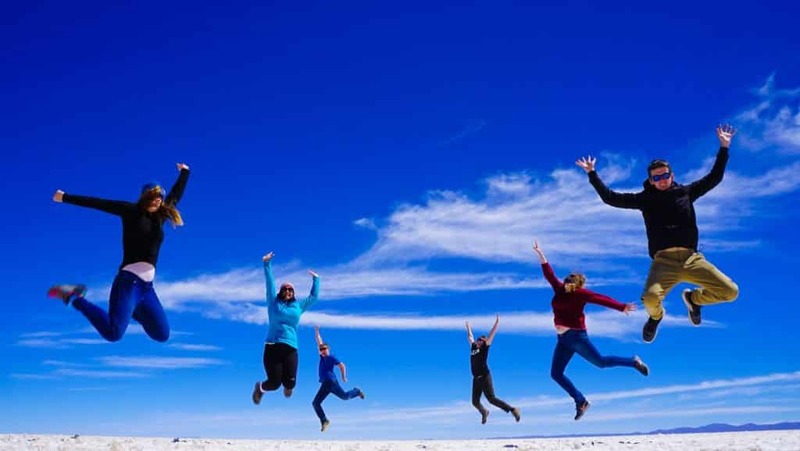 If you do opt for a Bolivian salt flats tours I highly recommend their San Pedro de Atacama to Uyuni 3 day tour. 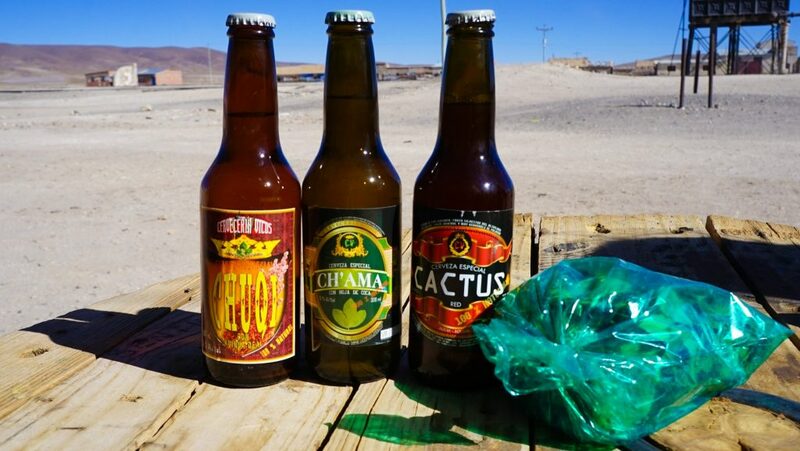 Just make sure you have left enough time for all the other fun things to do in San Pedro de Atacama before you go. 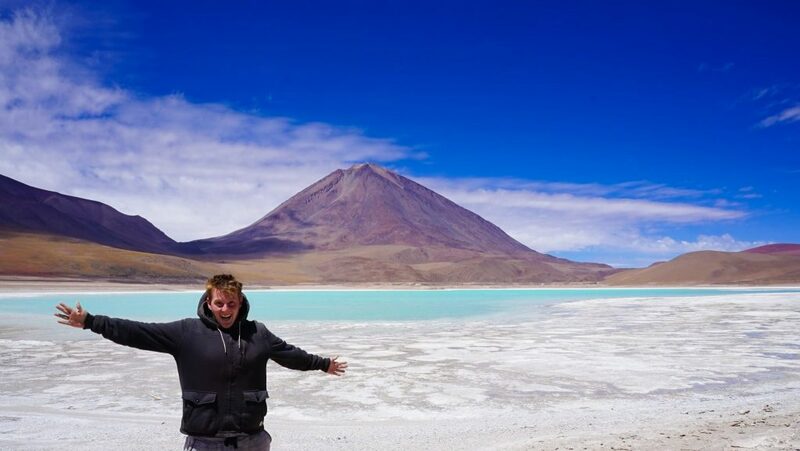 We signed up to one of their epic trips after hearing favorable reviews and were not disappointed – our journey began from the desert outpost of San Pedro de Atacama in Chile and 3 days later finished in the small lackluster town Uyuni in Bolivia, but you can do it in reverse if you like (or even a round trip!). 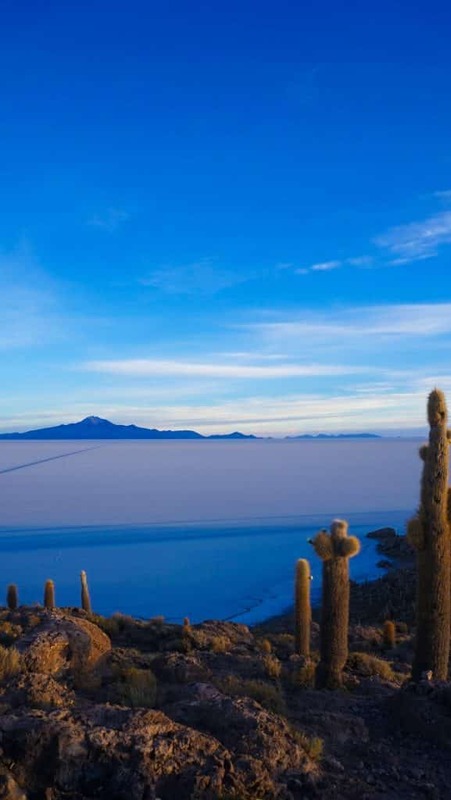 Now, let me give you a quick rundown of what to expect on your Bolivia Salt Flat tour. 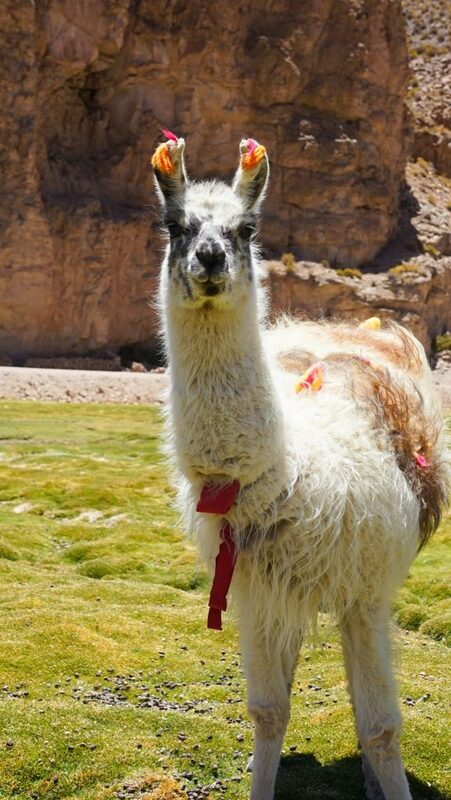 Hint: it will include llamas, flamingos, mountains and miles of salt! 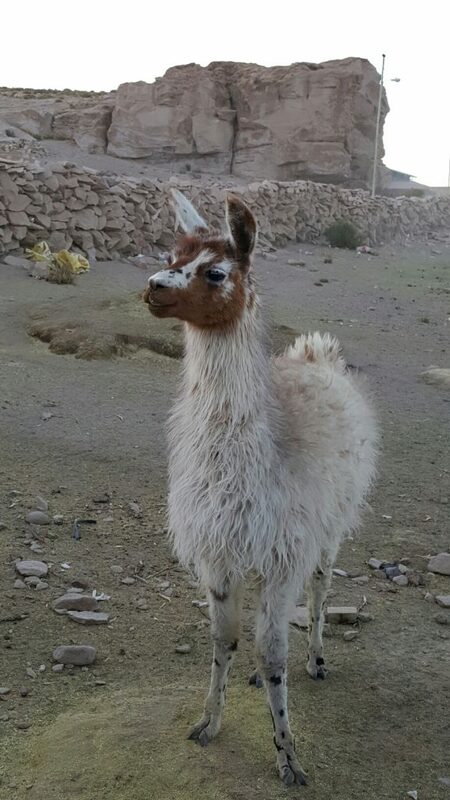 Day 1 of our Bolivia Salt Flat Tour/overland escapade started in the quiet Chilean border town of San Pedro de Atacama. An early morning departure means a pick up at 7.30am, and filled with excitement we headed to the nearby Bolivian border to begin our adventure! 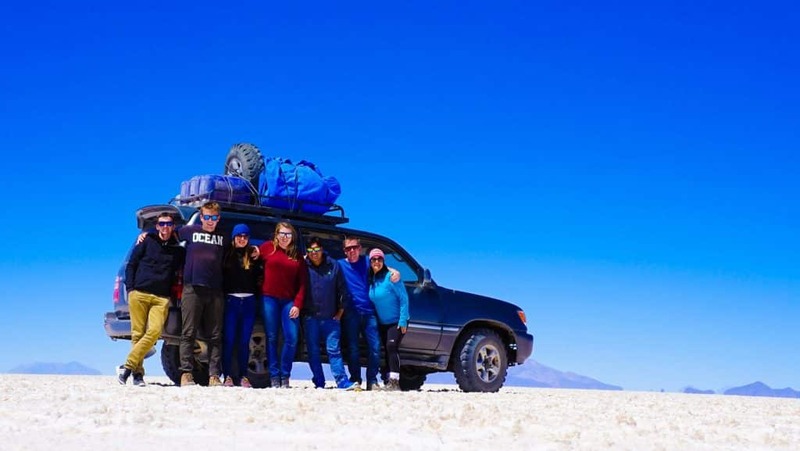 Here we switched from our van to the beastly 4WD jeep we would call home for the next three days and introduced ourselves to the other members of our party of 6… Hint: when booking a Bolivia Salt Flat ask the number of passengers and get it in writing. Any more than 6 and it will not be fun, trust me! A pretty casual affair compared to the normal border crossing with a basic wooden shack filled with two desks side by side inside and absolutely nothing else. After a couple of quick stamps, we were officially in Bolivia. 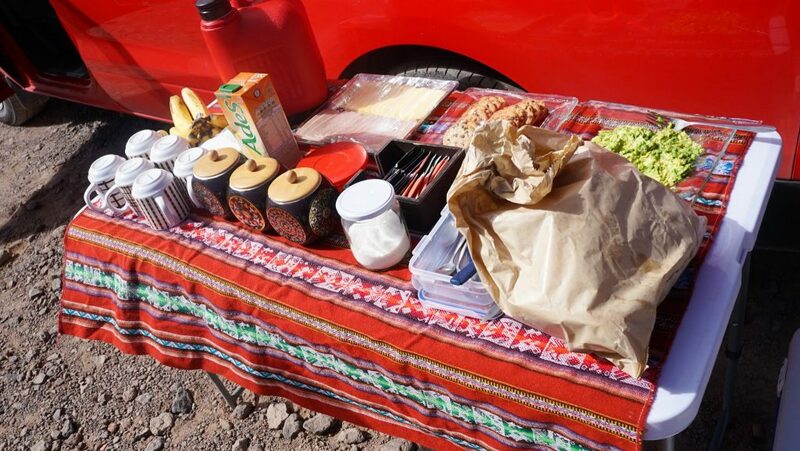 Feeling a little hungry our driver had perfectly preempted the situation by preparing breakfast while he was waiting – good start, and rather delicious! 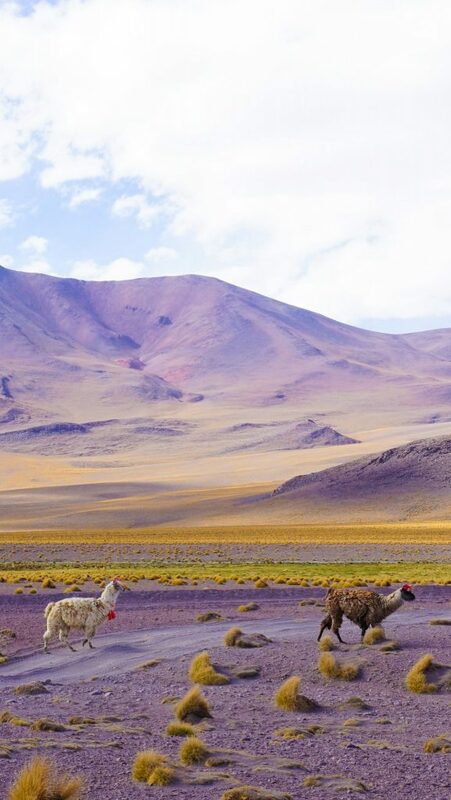 It also seemed so surreal, surrounded by volcanos and vicuñas watching in the distance while we had cheese, tomato, and avocado sandwiches and sipped our coffee/ coca teas. Once we’d ate as much food as we could fit we piled into the jeep and headed off towards the horizon. Stunning scenery, which would be the theme of the entire trip, was everywhere you looked! Having studied geography at university this was just like heaven to me! Volcanoes and lakes dot this high desert landscape, all coming in various shades and colors, meaning plenty of stops to explore and take photos! Around midday, we arrived at a small group of buildings beside a particularly serene lake next to which a small thermal pool had been built. 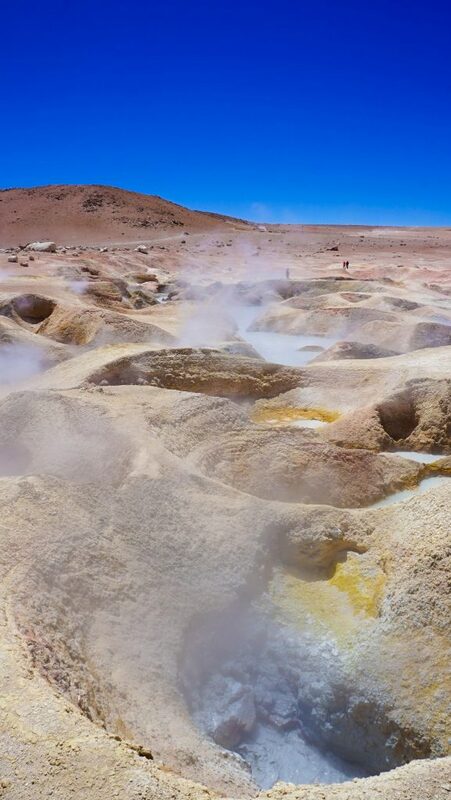 Our driver informed us that this was our ‘luxury Bolivian spa’, the water heated by the abundant geothermal activity of the area. A relaxing soak later and a short drive we got to see a much more intense display of this power at the Sol de Mañana geyser, an area of bubbling mud pools and venting steam. Just like being home in New Zealand! Bolivian regulations being as they are means that nothing is obscured by those pesky barriers that torment us at home, however, so we were free to get as close as our self-preservation instinct would allow! 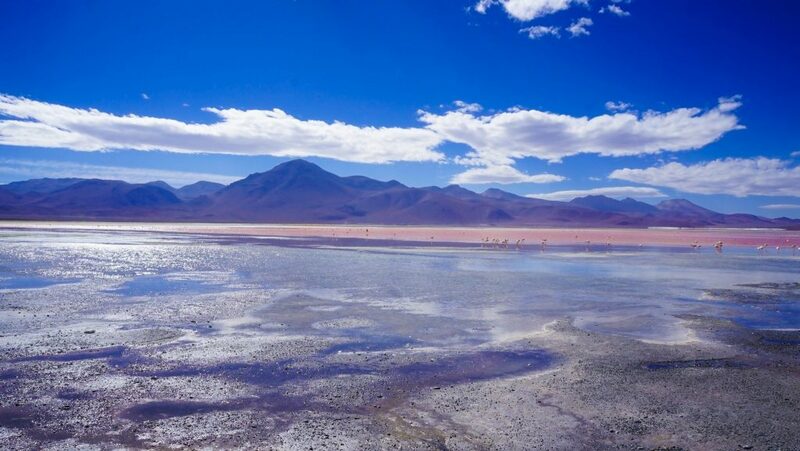 Just some of the natural wonders you can expect to see on a Bolivia Salt Flat Tour! Once finished tempting fate we headed to our final lake for the day, but we’re told something was a bit different about this one. As we approached from the distance it appeared as if the whole lake was a vivid pink but as we got closer we realized that the lake was not actually pink but rather blankets on flamingos, thousands upon thousands of them! 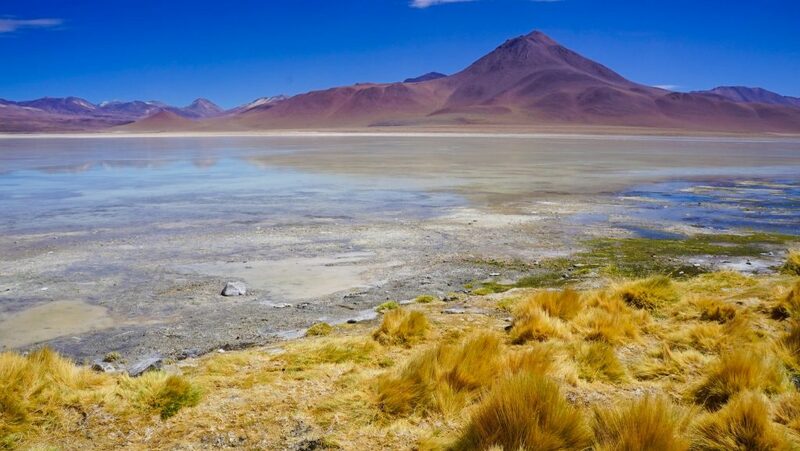 It turns out that this lake, the Laguna Colorada found at 4420 meters above sea level, is actually the main nesting center for these birds for the entire world with more than thirty thousand individuals across three different species. I still find it difficult to fathom such a thriving population in this otherwise desolate moonscape, but as usual, Mother Nature is as unpredictable as she is crafty! This was truly a spectacular sight I will never forget and a fitting end to such a memorable first day. It’s safe to say our expectations were now very high for the rest of the trip. However luckily for us, we found an added surprise. On getting to our accommodation for the night, while others preferred to stay inside we decided to make a short walk around the village. Much to the envy of everyone else we found these guys! If you’re a bit of a geology geek then you’ll love Day 2 where our guide explained all the strange rock formations and their origins. 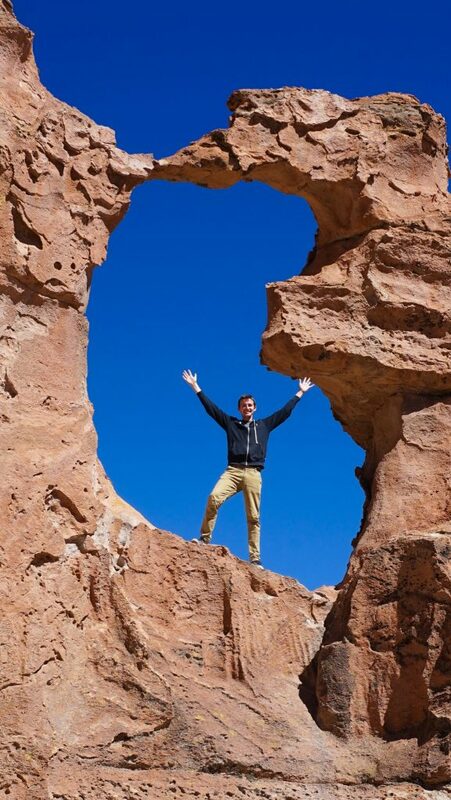 For everyone else, like myself, it’s a day filled with ‘pretty’ rocks that kind of look like animals or skyscrapers or trolls, as well as a day of beautiful rolling terrain sprinkled with many llamas (along with the never-ending pursuit of the elusive llama selfie). Oh and a death-defying gravity canyon where you can again tempt fate – which at this point was worryingly becoming a bit of a theme! 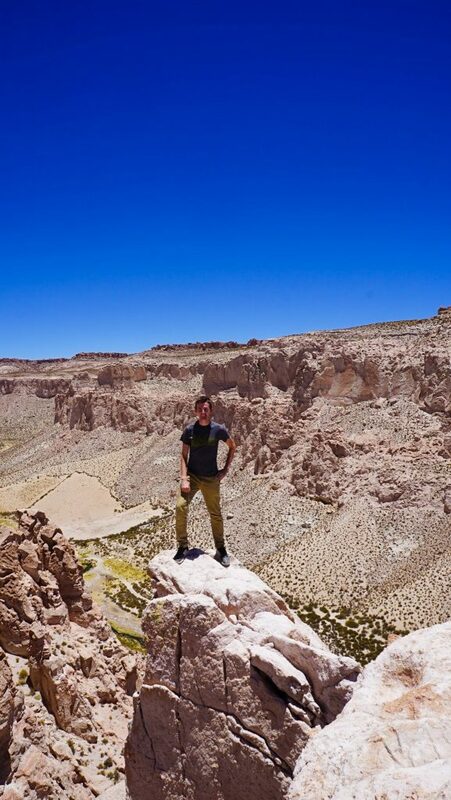 Yup, the San Pedro de Atacama to Uyuni 3 day tour offered way more than I expected! Day 2 is also the highest day where you spend most of the time 4000 meters or more above sea level. Make sure you have a bag of coca leaves handy to chew as you’re going to need it. It’s a well-proven method to help with the onset of mild altitude sickness and the headaches that go with them. As they say, when in Rome do as the Romans do right? As the day went on and we gazed in awe at the impressive scenery which was passing us by, our driver told us he had a special spot he was taking us too, one most tourist don’t normally get to see! After a long winding road through a passageway in the rocks just barely wide enough to squeeze through we arrived. 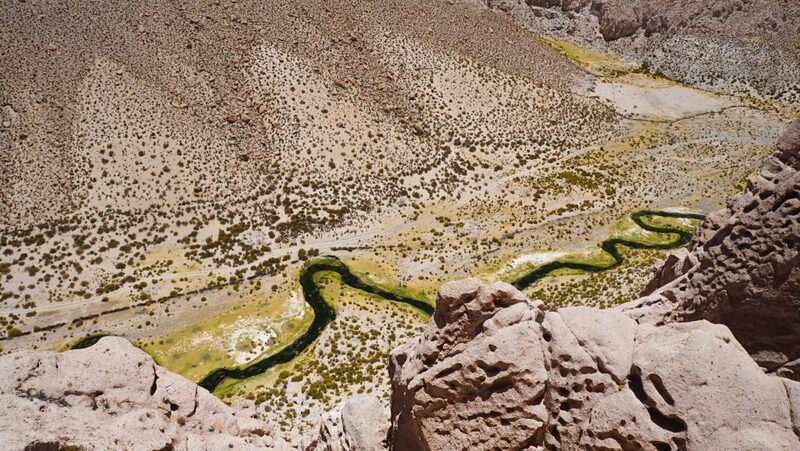 We were greeted by a picture-perfect valley, carpeted with moss, crisscrossed by trickling streams and bordered by steep rock walls. 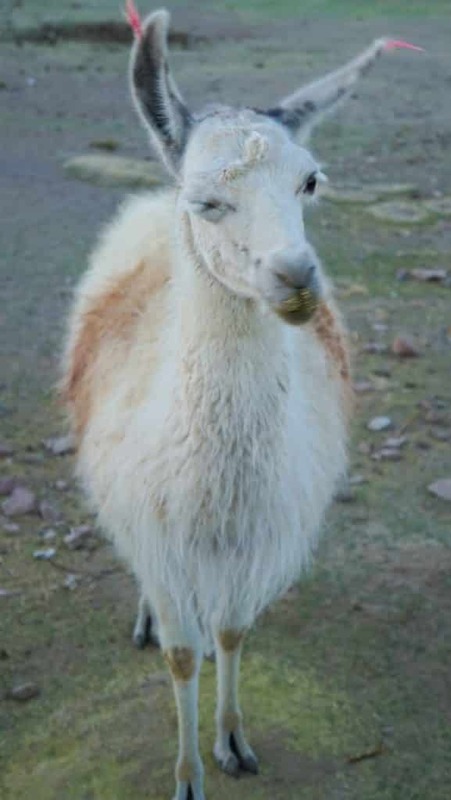 Oh and I forgot to mention the best part, the only other guests in this spot were hundreds of adorable llamas, the perfect addition to any occasion. What more could you possibly want? 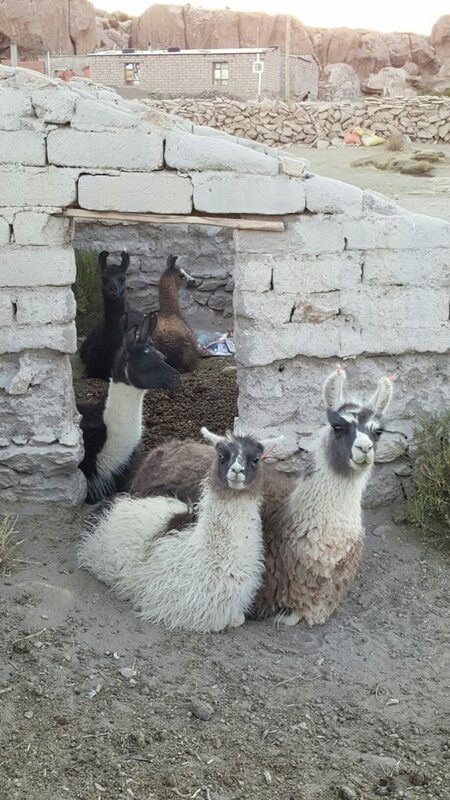 Llamas, llamas, llamas and yes…More llamas! After a bit of a hike around the area and a camera full of Insta-worthy photos, we headed to our lodgings for the night. Darkness feel just as we felt the terrain transition to the smoothness of the much anticipated Uyuni salt flats. In the complete blackness, we were unable to see anything but just knowing we had arrived built our anticipation for the next day. To further whet our appetite our stay for the night was in a real salt hotel….yup, that is exactly what it sounds like. 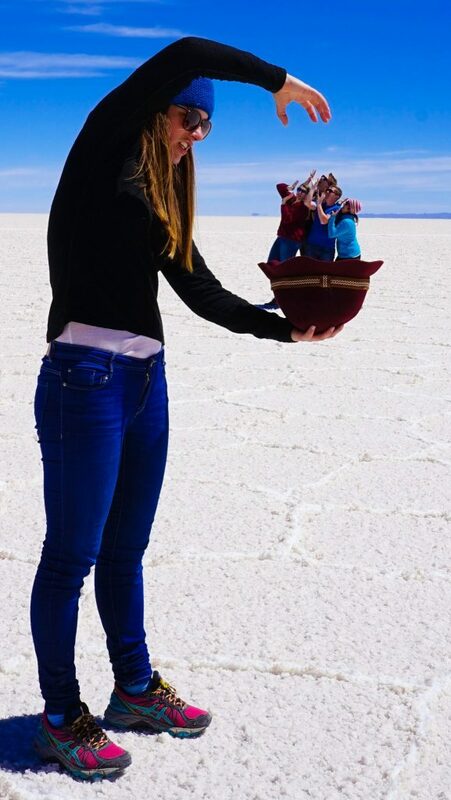 The entire place is made of salt! (Don’t worry, you get a normal mattress). 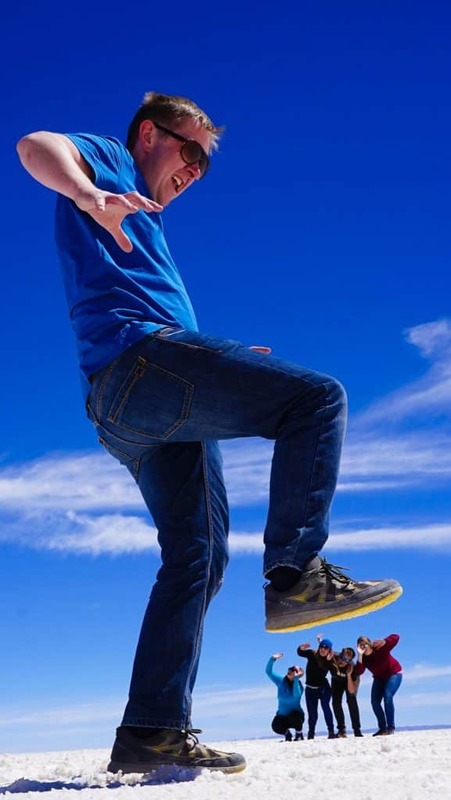 It’s actually not as weird as it sounds and a really cool experience, but I won’t be opting to live in one anytime soon – the crunching underfoot gets a little unbearable! Our adventures for the night, however, were not over as our guide took us out in onto the darkened flats to see one of the most amazing sights I have ever witnessed. The night sky and Milky Way in all its glory, unencumbered by urban light pollution. It’s just something you have to see to believe – but trust me when I tell you that you have never seen so many stars so bright in your entire life. I loved it so much and wrote a separate post on the Bolivia salt flat at night. Its 0530 in the morning, the sun not yet up, all of us looking very dreary eyed as we climbed into the jeep to begin Day 3, the finale. We set off across the salt, 30mins in a straight line, still not able to fully make out what was around us as the sun had yet to rise. 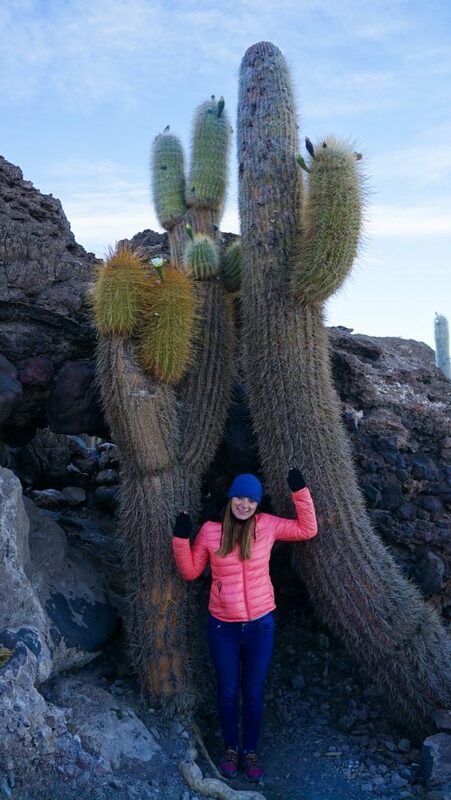 We’re heading to Cactus Island, a rocky mound covered in cacti in the middle of the Uyuni salt flats. While still dark we clamber to the top and after a short wait are rewarded with the most spectacular sunrise I can ever remember. This is also when the sheer scale of this place revealed itself and disbelief sets in. In every direction, as far as the eye can see, nothing! Simply flat, and white. Pinch yourself it is real, you are not still dreaming. 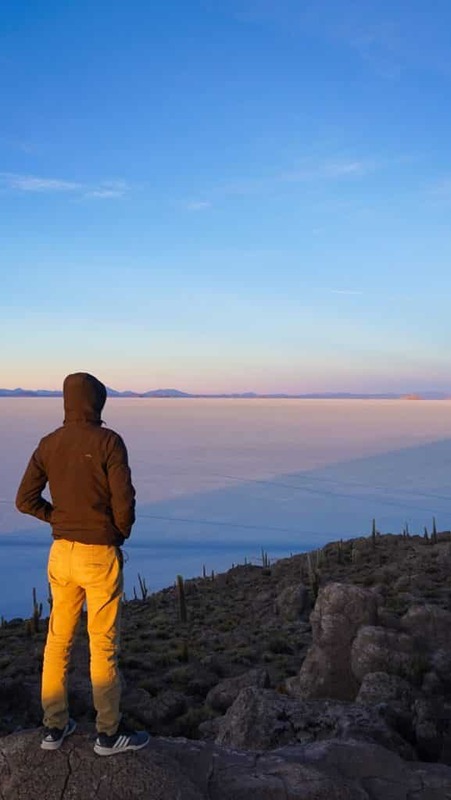 One of the only times it’s been worth it to get up before dawn and one of the biggest highlights of the entire Uyuni salt flats tour/expedition. The remainder of our final day was spent driving through this vast nothingness eventually coming to a spot when we really were in the absolute middle of nowhere. It was now time for the infamous, perspective playing, photo opportunities. We quickly gathered together the odd array of props we managed to pull from the bowels of our backpacks and set about making the most ridiculous poses while trying to perfect our scaled trickery. I’m not sure we quite achieved it but it’s a memory I’ll never forget! 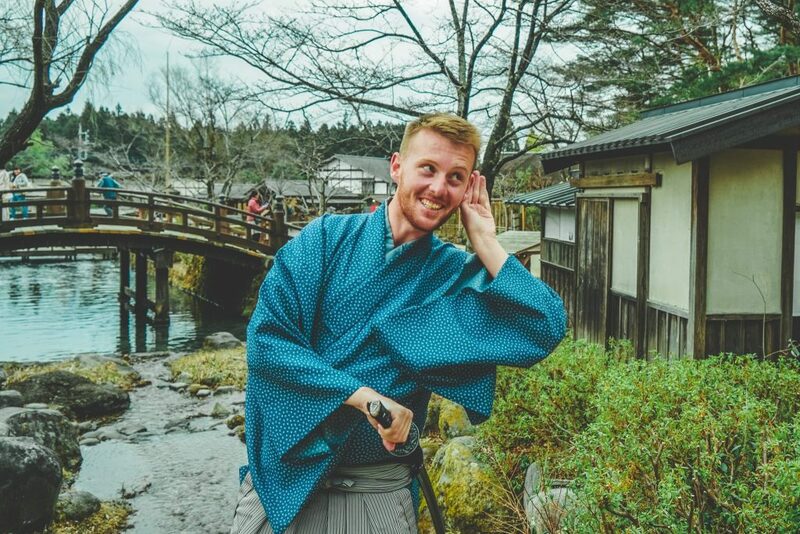 After an extremely varied amount of success and thinking we’d finally gotten the hang of it our guide, who had reached the end of his patience, decided he’d show us how it was done, out of what I imagine was sheer frustration with our complete and utter uselessness. Under his expert guidance and in a fraction of the time he bettered our attempts by far. It’s trickier than you’d think to get it right but he’d clearly had plenty of practice and made it look easy! 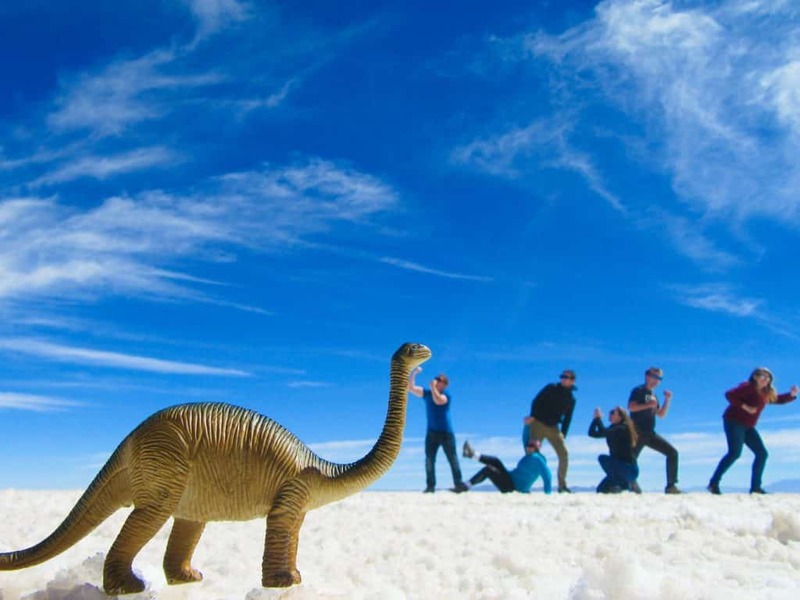 This is yet another reason to choose the right Bolivia Salt Flats tour company. 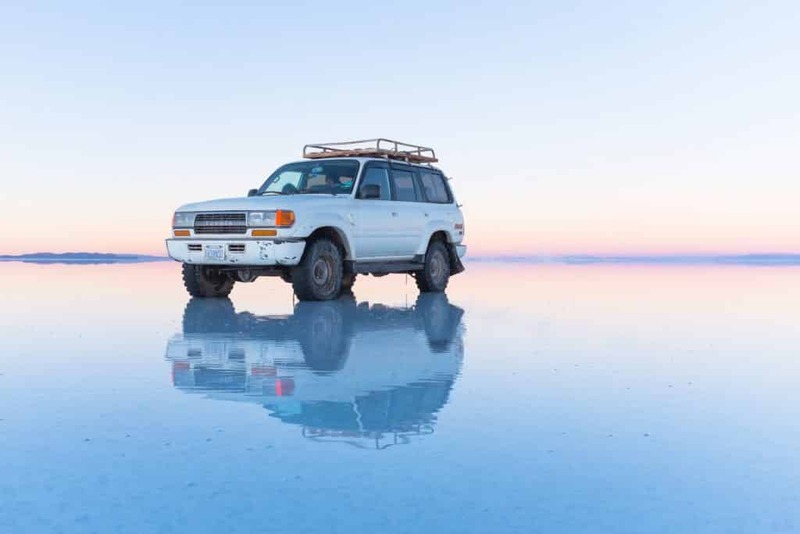 Since you do not exactly have alot of time to practice, you are going to want a guide who straight away knows how to help you get those perfect shots (and has plenty of Bolivia Salt Flat photography ideas). 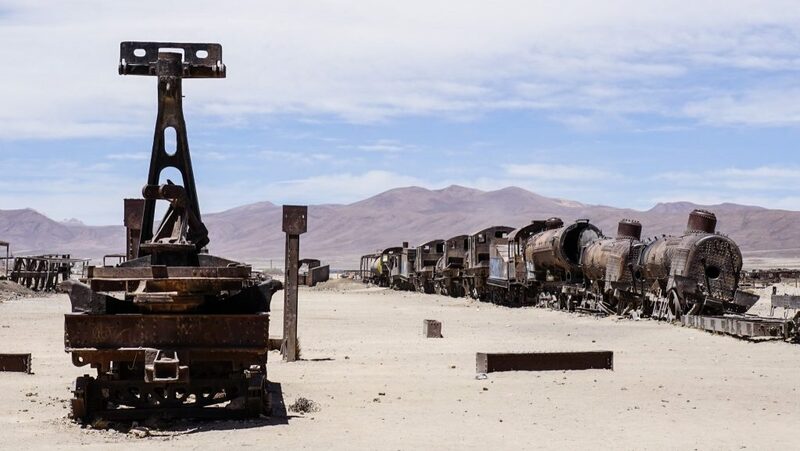 After this was the quick stop at a salt museum, a complete lowlight and honestly not worth mentioning – it’s disappointing and not a museum but rather a bathroom and souvenir stand – and then on to the last stop and a fitting end: The Uyuni Train Graveyard. Seeing the hulking iron carcasses of disused trains heaped together and slowly rusting in the harsh elements is mesmerizing and a tad creepy, something you’re unlikely to see anywhere else on Earth. 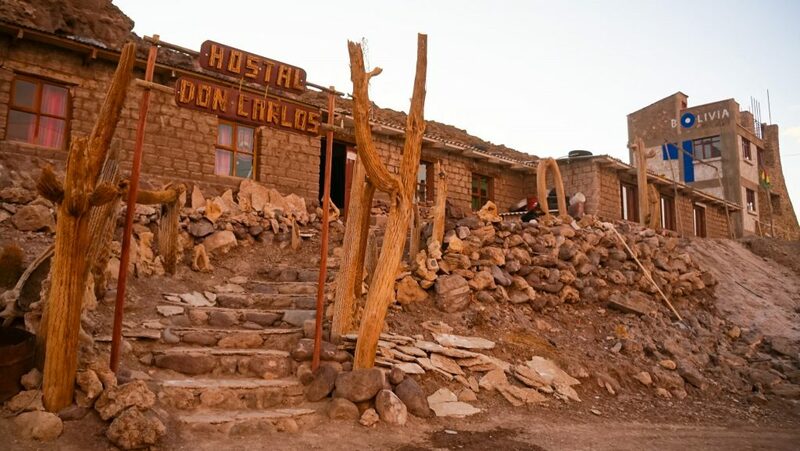 It’s utterly captivating and completely photogenic – get snap happy here as this is sadly the final stop before being dropped at your hotel just a few minutes down the road in Uyuni. Your tour is now at an end but assuming you have chosen a good company, you’ll have made some great new friends and have memories that will last a lifetime! 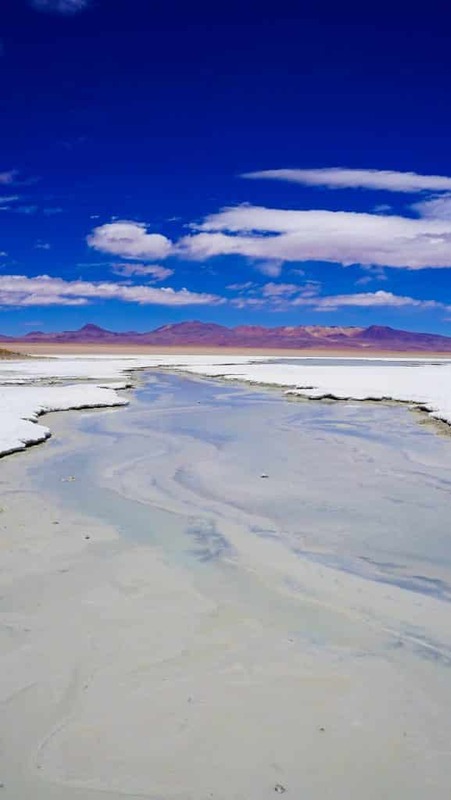 When Is The Best Time To Visit The Bolivia Salt Flats? 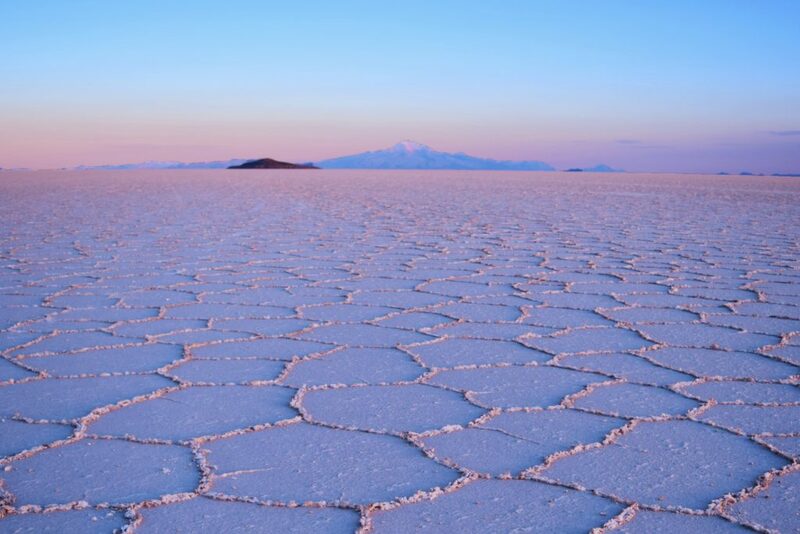 Well, to be honest, there is no salt flats Bolivia best time to visit, each season has its own distinct advantages! 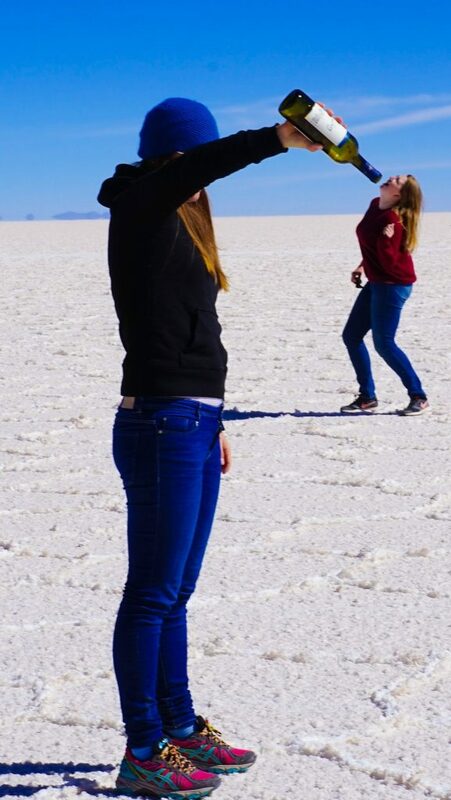 For instance, if you head out in the rainy season you won’t be able to get these famous perspective type pictures as the salt needs to be dry, but fear not…During the rainy season, a shallow layer of water extends across the entire flats creating a mirror image across the surface. 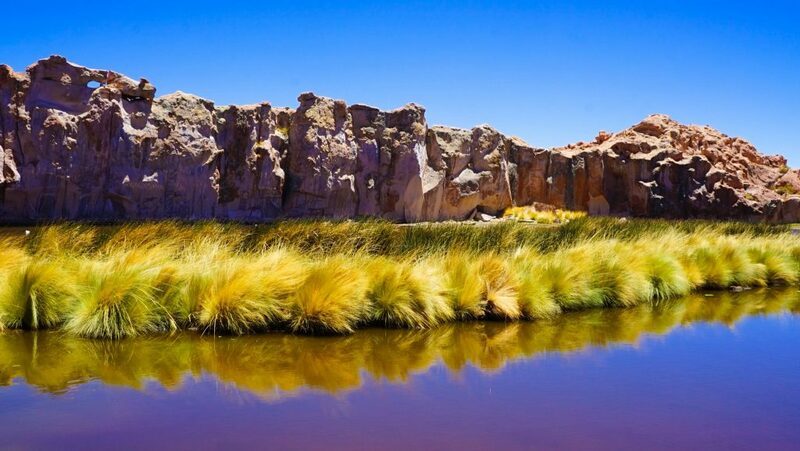 This creates some of the most stunning scenery with the sky being perfectly reflected across a never-ending landscape. So either season you win! 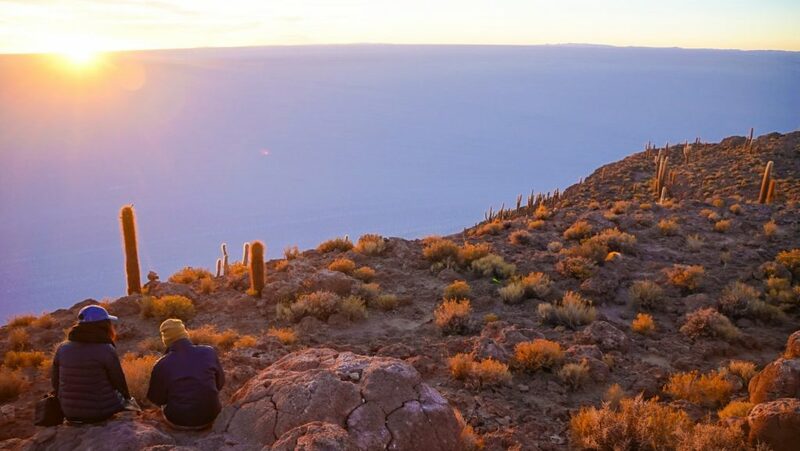 A truly magical adventure to fill a lifetime of dreams, this tour is absolutely a must do and a top highlight of Bolivia. Many companies offer this tour itinerary or a close variation but it can be tricky to know which one is best. We heard from many other people we bumped into along the way that had tours that had not provided what they had expected or been told when they originally signed up. Don’t lose hope however as there are definitely reputable operators out there. 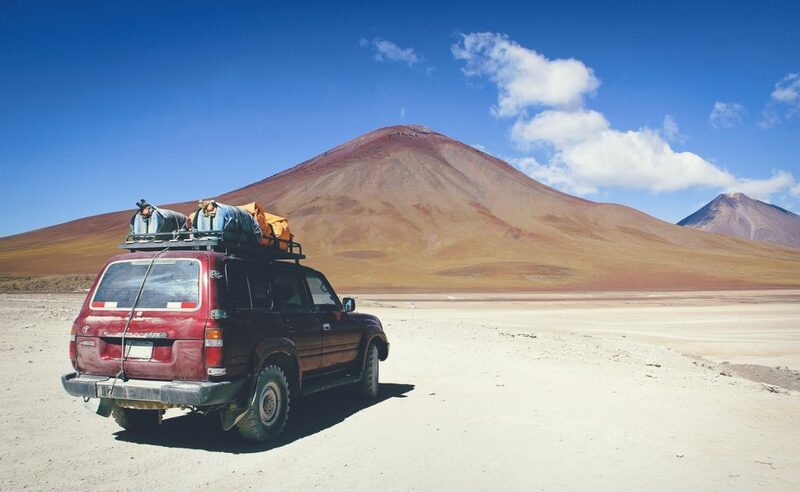 We decided to investigate those that were highly rated on good old TripAdvisor and agreed on Cruz Andina Traveller. Simply a perfect tour as it turns out and justifiably well rated. A great driver/guide, reliable and comfortable jeep and an excellent group of people to enjoy the trip with. Everything ran smoothly and the food was absolutely brilliant. Plus there was way too much of it while other groups told us they were practically starving! 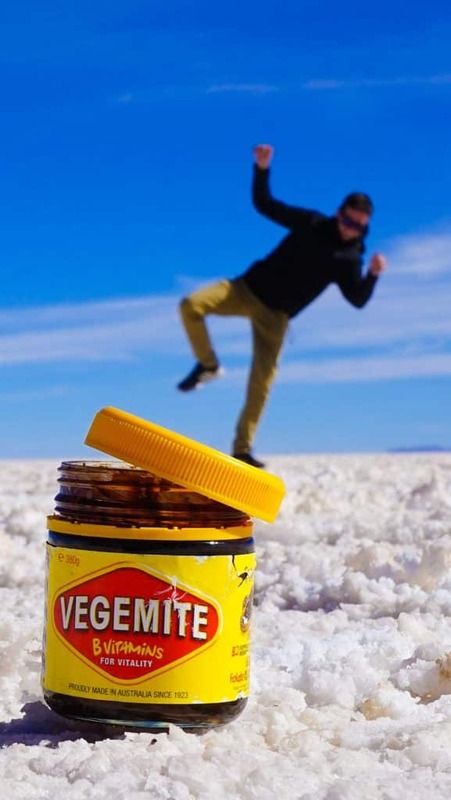 Indeed he even added some activities and stops that other groups didn’t have like seeing the Bolivian Salt Flats at Night. We only had a half hour delay due to a punctured tire (to be expected given the conditions!) and he was an incredibly responsible driver – no alcohol in sight (a relief given the stories we had heard!). 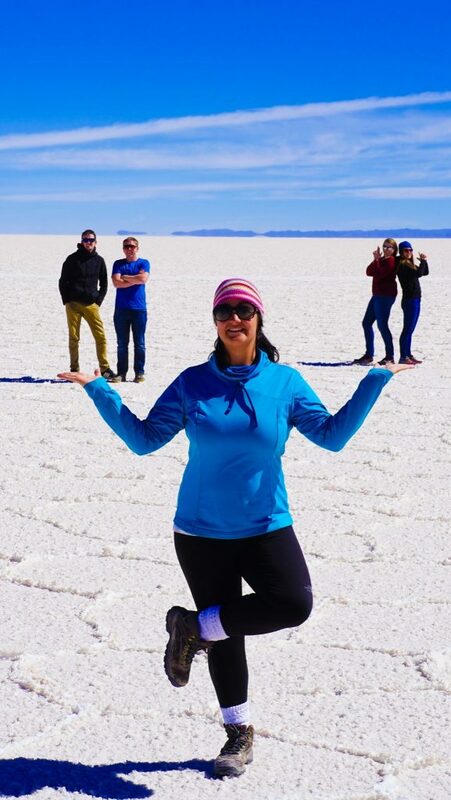 I cannot recommend a Bolivia Salt Flat Tour higher and cannot think of a better way to experience this once-in-a-lifetime opportunity than with Cruz Andina Traveller! So what are you waiting for – get planning NOW! Best Places to Eat in Sucre, Bolivia!